Walking With The Wounded supports a pathway for vulnerable veterans to re-integrate back into society and sustain their independence and to provide long-term security for themselves and their families. Our work wouldn’t be possible without the extraordinary efforts and generosity of our corporate partners and their employees. Walking With The Wounded develops compelling partnerships which deliver clear and substantial business benefits for the corporate and raises vital funds to help even more vulnerable veterans. We’ll work with you to create a programme of engaging fundraising activities that can be a great way of bringing people together from different departments and locations resulting in enhancing working relationships, encouraging team building, boosting job satisfaction, staff morale and retention whilst supporting vulnerable members of society. You can demonstrate your support for the Armed Forces by making a range of written and publicised promises setting out how your business will support members of the Armed Forces community who work for you or are consumers of your products and services. Walking With The Wounded can help you fulfil your covenant commitments and if you’ve not already signed up we can guide you through the process. In addition to the charitable fundraising opportunities that exist, we have a number of commercial opportunities available such as commercial sponsorship of our unique expeditions and flagship events or a collaboration through a bespoke cause-related marketing campaign. We’re proud of the brand we’ve created, its ethos and the positive reputation that has become synonymous with Walking With The Wounded and it provides a great platform to show your customers that you’re supporting a good cause. Soldiers have spent years developing additional experience as teachers, trainers, engineers, nurses, mechanics, construction workers and truck drivers, to name just a few. They’ve taught Afghan farmers to improve efficiency and modernise their crop growing. They drive more miles in a single day than any parcel carrier. In short, the experiences of today’s soldiers are as challenging and diverse as in any work force. 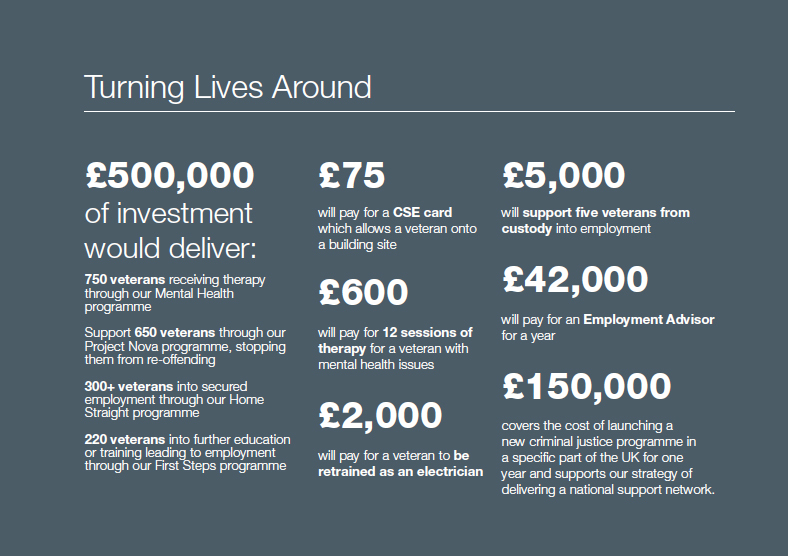 Companies have an enormous resource in the people they employ, their time, expertise and specialist skills can support us in delivering a tangible and sustainable impact on the lives of ‘Our’ Wounded. WWTW’s Mentoring Programme connects veterans with corporate professionals for specific mentorships.